As a sculptor of constructive geometric forms, George Hart's work deals with patterns and relationships derived from classical ideals of balance and symmetry. Mathematical yet organic, these abstract forms invite the viewer to partake of the geometric aesthetic. He uses a variety of media, including paper, wood, plastic, metal, and assemblages of common household objects. Classical forms are pushed in new directions, so viewers can take pleasure in their Platonic beauty yet recognize how they are updated for our complex high-tech times. Dr. Hart shares with many artists the idea that a pure form is a worthy object, and selects for each piece the materials that best carry that form. In one series of pieces, familiar objects are arranged in engaging configurations, displaying an essential tension between mundane individual components and the strikingly original totality. Because his works invite contemplation, slowly revealing their content, some viewers see them as meditation objects. A lively dancing energy moves within each piece and flows out to the viewer. The integral wholeness of each self-contained sculpture presents a crystalline purity, a conundrum of complexity, and a stark simplicity. Artist in Residence, Massachusetts Institute of Technology. New York State Council for the Arts Individual Artists Award. “Symmetric Sculpture,” Journal of Mathematics and the Arts, to appear, 2007. "The Geometric Aesthetic," in The Visual Mind 2, Michele Emmer (ed. ), MIT Press, 2005. "Creating a Mathematical Museum on your Desk", Mathematical Intelligencer, 2005. "Orderly Tangles Revisited", Proc. Bridges 2005: Mathematical Connections in Art, Music, and Science, Banff, 2005. "Spaghetti Code: A Sculpture Barnraising", Proc. Art+Math=X, U. Colorado, Boulder, 2005. "A Salamander Sculpture Barn Raising", in Visual Mathematics 7, no. 1, 2004. "A Reconstructible Geometric Sculpture", Proceedings of ISAMA CTI 2004, DePaul Univ. "Sculpture with Symmetrically Arranged Planar Components," Bridges/ISAMA, 2003. "Mathematics Takes Shape," Math Horizons, April 2003. "Solid-Segment Sculptures, "Mathematics and Art, Claude Brute ed., Springer-Verlag, 2002. "A Color-Matching Dissection of the Rhombic Enneacontahedron", in Symmetry, 2000. "In the Palm of Leonardo's Hand," Nexus Network Journal, 2002. "Loopy," Humanistic Mathematics, June 2002. Zome Geometry (with Henri Picciotto) Key Curriculum Press, 2001. "Rapid Prototyping of Geometric Models," 13th Canadian Conf. on Comp. Geom., U. Waterloo, 2001. "Symmetrohedra" (with Craig Kaplan) Proceedings of Bridges 2001. "Blending Polyhedra with Overlays" (with Douglas Zongker) Proceedings Bridges 2001. "Loopy," Humanistic Mathematics, June, 2002. 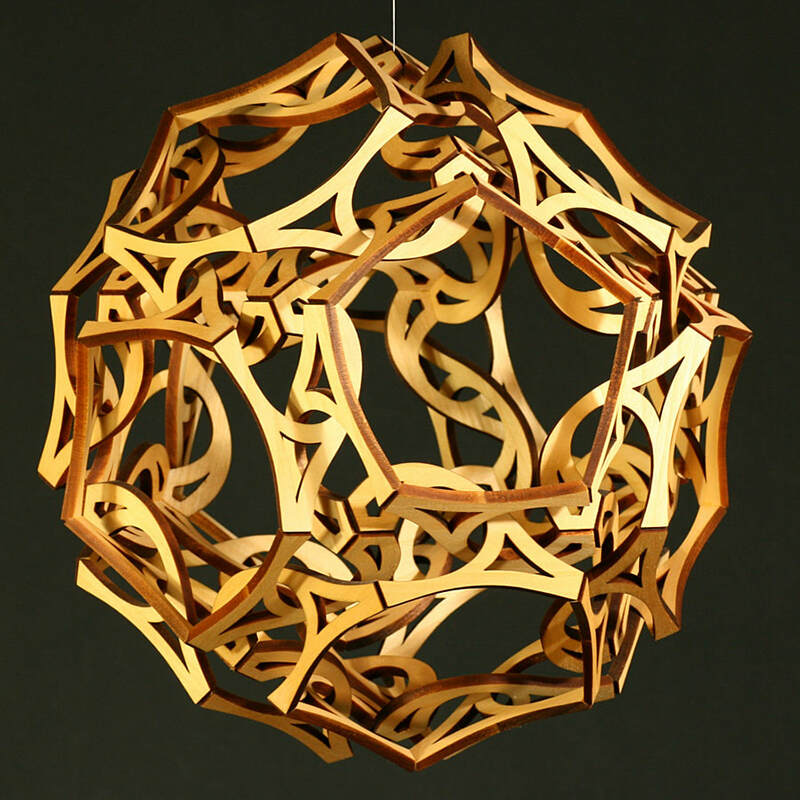 "Computational Geometry for Sculpture," ACM Conf. on Computational Geometry, Tufts University, 2001. "Solid-Segment Sculptures," Proc. Colloq. on Math and Arts, Maubeuge, France, Sept. 2000. "Millennium Bookball," Proceedings of Bridges 2000: Mathematical Connections in Art, Music and Science, Southwestern College, Kansas, July 2000, and Visual Mathematics 2(3). "Reticulated Geodesic Constructions," Computers and Graphics 24(6), 2000. "Zonohedrification," The Mathematica Journal, vol. 7 no.3, 1999. "Icosahedral Constructions," Proceedings of Bridges: Mathematical Connections in Art, Music and Science, Southwestern College, Kansas, July 1998. "Zonish Polyhedra," Proc. of Mathematics and Design '98, San Sebastian, Spain, June, 1998. Moravian College, Bethelehem, PA, April, 2004. Gathering for Gardner, Atlanta, GA, April 2004. University of Houston, TX, February 2004. Massachusettes Institute of Technology, Cambridge, MA, October/November 2003. MathCamp, Tacoma, WA, August, 2003. MathFest, Boulder, CO, July 2003. Bridges/ISAMA, Granada, Spain, July 2003. Southwest Research Institute, San Antonio, TX, June, 2003. University of Colorado at Colorado Springs, CO, July 2002. New Jersey Institute of Technology, March, 2002. Stony Brook University Distinguished Lecture, March, 2002. Colby College, Waterville, ME, July 2001. Southwestern College, Winfield, KS, July 2001. American Association for the Advancement of Science, San Francisco, CA, Feb. 2001. 10th Annual Workshop on Computational Geometry, Stony Brook, 2000. University of Waterloo, Ontario, October 2000. State University of New York at Canton, September 2000. University of British Columbia, Vancouver, BC, July 2000. State University of New York at Stony Brook, April 2000. University of California at Berkeley, 1999 and 1998. Carpenter Center for the Visual Arts, Harvard University, November 1998. New York Academy of Sciences, October 1998. MAA Mathfest, Atlanta GA, August 1997. Art and Math Conference, State University of New York at Albany, June 1997.